A Beautiful Ruckus: Thirty-One Bags Giveaway! I consider myself super blessed to be able to claim friends all over the world via my blog. Aw, you guys are so awesome! Thanks for walking this journey with me! In spite of the fact that I'm a stay-at-home mom now (and loving it...most days! ), I've been able to get to know a lot of people that I otherwise never would have met. That's one of the aspects of having a blog that I truly appreciate, and I've come to look forward to! Who is God going to bring across my path next? Exciting!! Today, I get to introduce you to one of my new friends and do a giveaway for one of her fabulous products! I know you are excited too! Woot, woot!! Courtney is a consultant with Thirty-One Bags. Beyond having heard the name of the company and knowing that they sell bags (like how I figured that out from the company name? ), I didn't know anything else about them. But I was intrigued once I started looking into it. The first thing that caught my eye were the patterns! I love options! Especially options that pull in the colors of fall. Right now, the company has some really beautiful patterns and colors that are inspired by the season. 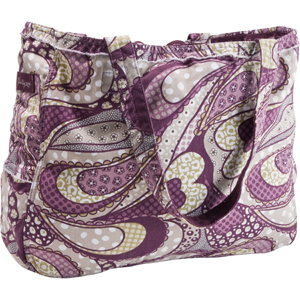 Of course, I've always had a soft spot for anything purple, but this one is my favorite pattern! Isn't it cute?? But what really caught my attention was Courtney's story. Courtney and I have been working on this giveaway for a couple of months. We almost had it up and running several weeks ago, but had to reschedule due to the health issues of one of her kids. I had the privilege of getting to talk with Courtney for over an hour a few weeks ago as she started from the beginning and shared her life with me up until this point. She has been through the wringer, but her amazing faith and reliance on God totally inspired me. Courtney is a single mom with three children. Her 15 year old son has some extremely severe medical issues. In the past few weeks, they were finally able to get a partial diagnosis for him of Graves Disease, but his overall prognosis isn't good. The doctors told Courtney that he needs to get as much living in now as possible before his diseases, both diagnosed and undiagnosed, continue to sap his quality of life. The unfortunate part is that Courtney is faced with medical procedures and tests that insurance won't pay for, or watching her son lose his battle. And honestly, she told me that there isn't a decision to make. She is doing everything she can to help him live as long as possible. And on top of that, she also has two daughters, one with epilepsy and one with a heart condition. And Courtney has had cancer three times. Any one of those things would be a heavy burden for a mom, but all of it at once? Whoa. When our conversation ended, I was amazed at the how much faith she has that God has His hand on her family and especially on her son. Wow! What an honor to get to meet her, hear her story, and share it with you! That story is why she decided to start selling Thirty-One Bags. It's an attempt to keep up with her family's medical bills and still allow her son to have opportunities while he is able to experience them. So with that background story, let's get on to the giveaway! Courtney is giving away one of these Super Organizing Totes, valued at $50, to one lucky winner! She chose this tote specifically for this giveaway because it's HUGE! It has five pockets on the outside along with a zipper on top to close it. On top of that, she is going to let the winner pick the pattern of their choice! Are you drooling yet? I'm dreaming of all of the kid stuff I can throw in there and take with me in the car! Or an easy way to keep all of my crayon and art supplies together for the kids. Or I could put all of my little baking accessories in there (piping tips, piping bags, decorating utensils, etc.) Oh. My. The possibilities...!!! I have included a new option with this giveaway that hasn't been available in the past. If you choose to purchase something to support Courtney in her efforts to pay her son's medical bills, you will get 10 extra entries. This is not mandatory to win, but I wanted to make it available. To get your 10 extra entries, you will need to make sure that you click here so that "A Beautiful Ruckus" shows at the top of the screen when you are on the website. That is the only way I have of verifying entries! Also, there is no minimum purchase that is required to get the 10 extra entries. Anything counts! Please also make sure that you choose to ship it directly to yourself instead of "the host" (as much as I'd love to see all of your products, I can't re-ship them all out to you). Courtney didn't ask me to include this option, but I offered, because I understand the stress that additional medical bills can place on a family. If you have been thinking about buying a new bag or want to get a little Christmas shopping done early, please consider supporting Courtney! Regardless, make sure you take a minute to jump on this giveaway! The contest ends at midnight on Tuesday, October 9th. The winner will be announced and contacted by email on Wednesday, October 10th. The winner will have 48 hours to respond to the email with their pattern of choice and mailing address so that Courtney can ship the prize. This giveaway is open to residents of the United States. I received no compensation in return for writing this post. DONEeditShare the Giveaway on FaceBook! I like the Fold and File and absolutely love the Plum Stripes Pattern! Well there is the collegiate tote~I could easily fill that for an outing. Then there is the fold and file I think is intriguing, and I hear the thermal bags are amazing though not much use for that one. And that is just a start, I saw the black leather bag yum! I love 31! I feel inspired by your friends story. I have the storage tote! I actually have two! Great for pool! I like the purple on that you like also! I love anything that is purple. I love the retro metro tote but cannot decide on the pattern! I love the way the super organizing tote looks - I've got one of the smaller ones already and LOVE it! My favorite is one a friend gave me, the organizing utility tote in circle spirals. I use it for my school stuff and love all the pockets. Thanks for hosting! I would love to win what you pictured! I am a blog follower. And I would love the Casual Cargo purse in Say it Taupe! I love the about town blanket! I'm always getting cold, so I have random jackets, and blankets in my trunk for "emergencies"! This would help me stay organized for sure! I just recently was re-introduced to these bags and love them! Oops, I forgot to put my favorite item. It is the skirt purse. I've heard a lot about them and am so excited for your giveaway! I'd like any of the storage totes. I might just have to check out the catalog again! I like the XXL Everyday Tote, but I really wish there was a way to see the inside on-line. Are there pockets inside or divided compartments? Is it all open space? Courtney, thanks for jumping right on that question! It's so great how knowledgeable you are about the features of these bags! Therese, does that answer your question? Newest follower from Let Them Eat Cake. I hope you will come over and follow me back. I haven't had the pleasure of owning anything from 31 yet though many of my friends do! They all love the organizing utility tote! I could get a lot of use out of one! I like the Retro Metro totes! Love the RetroMetro totes too!!! I loooove the Casual Cargo Purse! I like the XXL Everyday Tote in Circle Spirals. I love the retro metro tote! So cute! I love the totes! Awesome giveaway gals. I can't wait to get one of the new super organizing totes.....don't we all need just one more bag?? I have a serious "bag" issue...I have a ton of these but somehow think I need more! So I forgot to put my favorite item....is there just one?? I love the all in one organizers the best! I love the weekender tote. I like the About Town Blanket. That would be great to keep in the car for outings. I like the All-in-One Organizer. 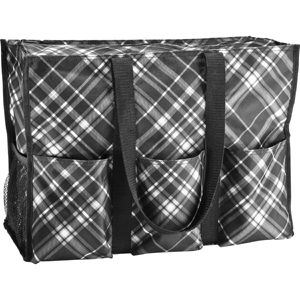 My all time favorite product is the Large Utility tote! !